Simon Parker has been pedaling and sailing up a storm. Perhaps the oddest juxtaposition of British journalist Simon Parker’s just-completed 50-day bike ride across the United States was Day #38. I was just ten feet from the screeching tires of 33 high octane racing cars as they set off on a 500-mile quest for sporting glory. Roared on by 400,000 spectators, the cars coughed and purred their way around the 2.5 mile circuit as fighter jets banked overhead and A-listers milled on the red carpet. As an example of just how out of touch I am with so-called ‘popular’ culture, I spent 10 minutes standing next to an attractive and familiar looking young woman in the media area next to the pit stops. But I just couldn’t put a face to a name. A Google search suggests she goes by the name of ‘Mrs. GaGa’ – or something like that… Cycling effortlessly in and out of the circuit as huge crowds struggled on foot with beer coolers and picnic hampers reminded me of the six years I performed at Glastonbury Festival. The best perk was an onsite vehicle pass that I often abused brazenly to deliver beer to my campsite, much to the disdain of bemused stewards and campers. Parker filed a report for the BBC World Service about his weekend in Indianapolis. 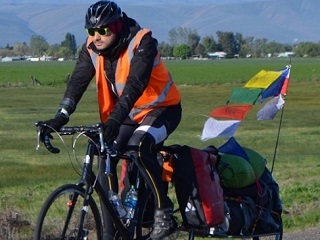 It’s been fun to follow along on Facebook as the journalist completes his very ambitious cycling and sailing journey from China to London. On Monday, he set sail from New York aboard a boat visited by Daily News reporter Diana Crandall. “Mentally, dealing with this environment is hard,” said Simon Parker, 29, a journalist sailing and cycling from China to London — and making part of his journey on the yacht. Parker began his 133-day land-and-sea odyssey March 20. Bon (rest of) voyage!